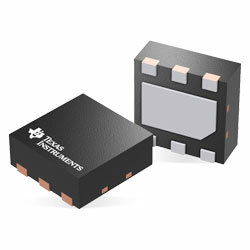 Texas Instruments TPS745 Adjustable 500mA LDO Regulators provides a very low quiescent current and provides fast line and load transient performance. The device has an ultra-low dropout of 130mV at 500mA that improves the power efficiency of the system. The device supports an input voltage range from 1.5V to 6.0V and an externally adjustable output range of 0.55V to 5.5V. The low output voltage enables the device to power the newer microcontrollers with lower core voltages. The device also features a power-good output that monitors the voltage at the feedback pin to show the status of the output voltage. The EN input and PG output can be utilised for the sequencing of multiple power sources in the system. The device includes integrated thermal shutdown, current limit, and UVLO features. The LDO regulators are stable with small ceramic output capacitors, allowing for a small overall solution size. The device is available in a small, six-pin, 2mm x 2mm WSON package and is perfect for a broad variety of applications.